Red River Real Estate and Vacation Rentals - Bunker Hill, Red River, New Mexico. 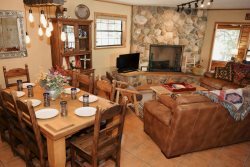 Bunker Hill is a great cabin for couples and small parties looking to come to Red River. This cabin is a one story, one bedroom, and one bathroom rustic home located right off of Main Street and just a short walk from the Ski and Summer Area making it perfect for the activities Red River has to offer! Once you walk through the front door you will see the kitchen to the left hand side and just beyond that you will find the living room. Bunker Hill has a small flat screen TV and DVD player giving guests the options of watching satellite or movies brought from home. The sofa in the living room is a pulls out for an additional queen bed for guests. Off of the living room you will find the only bedroom in Bunker Hill with a king bed and access to the hallway full bathroom. Even though this cabin is just a one bedroom, you will still notice that the bedroom is spacious! Stay at Bunker Hill -- where you are close enough to enjoy all the main attractions that Red River has to offer! Single home with easy access to entry. One queen bed, one queen sleeper sofa. Outside seating on small front patio. Bunker Hill provides satellite and a charcoal grill. Bunker Hill pet policy: Pet friendly! The workers at your office were very nice and helpful.